What is that woman writing? We’re sitting along the wall in what I’m calling “our spot.” I seem to default here when I come in; the light is good and I’m out of the way from the main path. My husband finished his mocha coffee latte drink a few minutes ago and is checking something on his phone. I glance over his shoulder and see a woman writing. I don’t know how I know that she’s writing something personal, but I do. Maybe it’s the slouch her shoulders, determined but relaxed. Maybe it’s the slow way her hand moves, the pause she makes, deliberate yet light and free. She’s focused but not intense. Is it a story? Journaling? A project? My husband half turns, that way, when you try to casually stare without being obvious. I’m staring directly at her. She doesn’t notice me. “I can’t tell,” he says. Neither can I, but it’s time to leave. “I want to see,” I say. The exit is behind me; there’s no reason for me to move in her direction. I stand up and shrug my coat on. I make my go-to excuse, and I say it loud enough so that if she was listening, she wouldn’t be suspicious. “I’m going to use the bathroom before we leave.” That door is in front of me, so I can conveniently walk past the writing woman. She is writing Thank You cards. The cards are white, but they don’t have that white embossed shiny-matte, off-white texture of wedding cards. Her cards have Thank You in black, neutral font. The text is friendly and readable, not some flowery script but not a dull Garamond or Times New Roman. There’s a color design clustered in the center around Thank You–flowers, I think–but the style is neither masculine nor feminine. There’s a stack of cards next to her in a non-descript box with a flimsy plastic lid that you’d find in a Hallmark store. It looks like she’s writing with an ink pen, nothing fancy but higher quality than you’d get in an office supply store. I see all of this in about 5 seconds, maybe 10. Staring can be creepy, and there’s no time to casually chat. I don’t want to disturb the magic. She’s intent and focused and fortunately doesn’t see me staring at her and the table full of notecards. I don’t bother to fake-stop in the bathroom. I think of this now because it’s April, the month of so many things: National Poetry Month; Camp NaNoWriMo; National Rebuilding Month; Testicular Cancer Month, Autism Awareness Month, and National Card and Letter Writing Month. I started writing letters to my friend about two months ago. These are notecards from Target $1 Spot. The 8 cards are all the same design with the word “Gratitude” on the front. I bought them because they’re a friendly peach color with matching envelopes. So far, I’ve received no letters in return and I don’t expect any. I write as if we were talking side by side and, yes, I write them when I’m in coffee shops. These small cards aren’t intimidating because there’s only room for a thought or three, just short and fun. And now I discovered a whole movement. There’s a campaign called Write_On which distributed 10,000 free writing starter kits to encourage people to write a letter a day in April. I’m not a fan of setting daily deadlines; to me, it’s a setup for self-failure if you miss a day. Regardless, I signed up for and received one of the kits. The six-card kit includes envelopes for mailing–as a papercrafter, I can say that including envelopes is the polite thing to do. 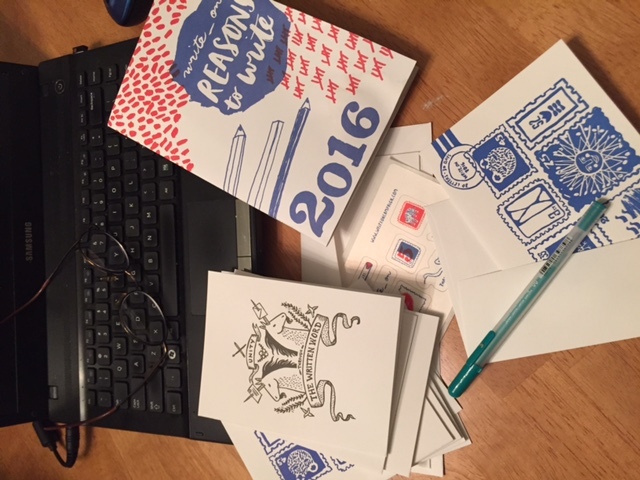 There’s stationary with envelope, stickers, a colorful inspiration booklet and a gelly roll pen. I’m a writer. I like paper. I like pens. Any letter writing I do, once a day or not, spreads more joy than if I didn’t write at all. I’ll never know what that woman was writing or thanking people for, but do I need to? Nice, sweet story. I enjoyed it. Diana, on my wish-list is a small writing desk, stuffed with stationery and ready at any time for me to sit and do no other writing than personal notes and cards. Dreamy thoughts. I love that you and Write_On are encouraging the practice. You can always start with a decorated box, maybe something a big-box craft store has for holding photos, and buy a few packs of cards there or a local specialty paper/stationary store. Make it nice. Go into the PO and buy a sheet or two of nice postage stamps–no blah flags or buildings; we’re talking flowers and cartoon characters here–and put them in that box. Plop a casual pen in there, and you’ve got a stationary-to-go setup. Enjoyed your observations. Getting letters instead of bills is always nice. Have your children take time to write a letter to someone. What a surprise for the receiver of the note or letter! It is a delight, knowing that someone took the time to stop in their day and think of you. I hope you are treasured to write or receive such letters. Write_On prompts that intrigue and scare me: write a letter to someone you live with in your house AND write a letter to your mail carrier. Thanks, Phil. Glad you think so.